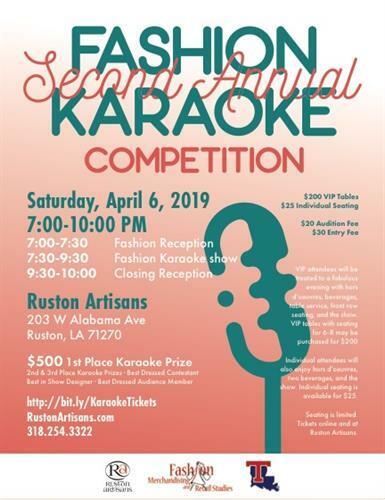 Louisiana Tech University’s Event Planning Class in the Fashion Merchandising and Retail Studies Program, Instructor Penny Humphries, has partnered with Ruston Artisans to celebrate Ruston Fashion Week with the Second Annual Fashion Karaoke Competition on April 6, 2019 from 7:00 pm – 10:00 pm. Singers will be auditioned and the ten best entries selected for the show. The first place winner will receive $500, with smaller prizes for the second and third place. Each selected singer will be styled by a Louisiana Tech University Fashion Event and Planning student with clothing from local fashion merchants. Participating fashion students also have the opportunity to win best in show for their fashion selections, staging, and marketing efforts. In addition, one best-dressed audience member will be selected for his or her own award. Independent judges will make all decisions. The event will commence with a reception from 7:00-7:30 pm. The show is scheduled to begin at 7:30 pm. VIP tables with seating for 6-8 may be purchased for $200; individual seating is available for $25. VIP attendees will be treated to a fabulous evening with hors d’oeuvres, beverages, table service, front row seating, and the show. Individual attendees will also enjoy hors d’oeuvres, two beverages, and the show. A portion of sales will be donated to a scholarship fund. Contributions may be made to each contestant and fashion student. Contributions made prior to the show will receive a stage mention. Event sponsorships include Fashion House Sponsor ($1000), Diva Designer ($500+), Super Model ($250+), and Top Model ($100+). Each level will receive promotions commensurate with the level. To learn more about the event, donations, and/or sponsorship, please contact Judi Null at 318-254-3322 or email rustonartisans@gmail.com. You may purchase in advance online or the door.